Pianist Pierre Nicolas Colombat spoke Monday evening at College of Fine Arts about the characteristics of Claude Debussy and Claude Monet’s works. COURTESY OF PIERRE NICOLAS COLOMBAT. Pierre Nicolas Colombat, a doctorate of musical arts candidate in CFA, presented “Music, Monet, and Misnomers” and took to the podium to give a lecture on Debussy’s controversial status as a member of the Impressionist movement. 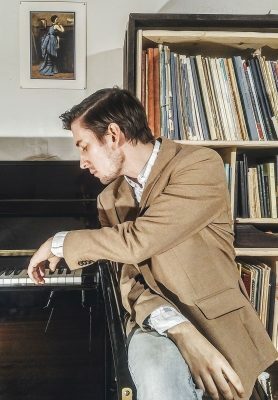 Colombat, who first began playing piano at age five, said he found a deeply rooted connection to Debussy’s artistry. As the son of a French father and American mother who both teach French, the language was an integral part of his upbringing as a child and a musician. “I can really feel when I play his music that he was looking for something beautiful — that he, Debussy, thought was beautiful — not what French society would think was beautiful,” Colombat said in an interview. The crux of Colombat’s presentation marked the distinction between Impressionist painters and the musicians who lived during the Impressionist era. Gila Goldstein, chair of CFA’s Piano Department, said she hoped the lecture would encourage students to explore the implications of calling a musician an impressionist. Goldstein, who organized the lecture, said she found Colombat’s presentation helpful in defining the Impressionist movement itself. In between his PowerPoint slides, Colombat took to the grand Steinway piano behind him. As he played the first notes of Debussy’s “Nocturne No. 5 in B Flat Major,” Owen Dodds, a first-year graduate student in CFA, nodded along to the performance. Dodds, who said he was a big fan of the lecture, said that Debussy had an affinity for adding layers of “light” to his music. Goldstein said she sees this light in Debussy’s series of preludes through his decision to wait to title his pieces until the very last page. As a musician and performer, Colombat said he feels a strong sense of desire from Debussy’s pieces. Despite scholarly comparisons between Debussy’s music and Monet’s paintings, Colombat said the key to avoiding mislabeling a musician’s era or movement is simple: trust what you know. For Colombat, humility is the best method of approaching another composer’s work.